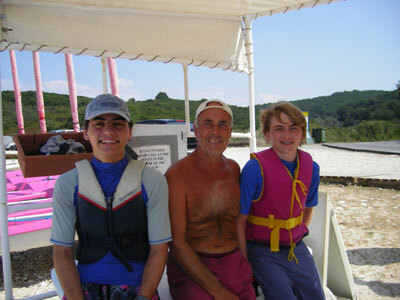 Sailing in Corfu was an amazing experience and one I won't forget easily. 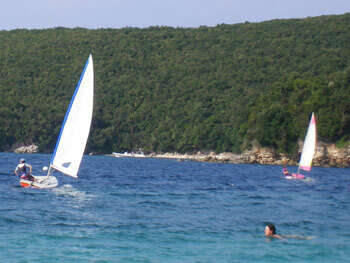 The island itself is located just off the west coast of Albania and is the northern most part of Greece. In fact Albania was so close you could see it very clearly and see buildings on the other side of the water seperating the two places. Corfu itself is an incredible island offering a climate and scene much like the Caribbean with the heat of the day reaching 35 degrees plus and completely blue skies almost every day. Despite this the wind in the afternoon reached a lovely Force 5 on most days, which is perfect sailing weather for intermediate and advanced sailors. We already had some idea of the sailing that could be done, due to our contact with the centre's owner Jan Flieger, a really great guy who was very passionate about what he did. 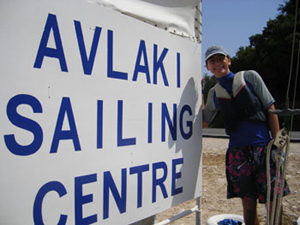 Jan started the sailing centre in 1995 and has seen hundreds of people come to him for sailing tuition and rentals in the Mediterranean holiday environment in Avlaki, Corfu. 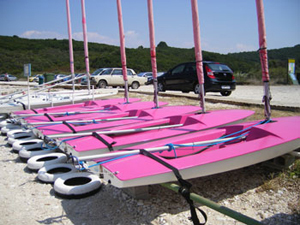 The sailing centre in Avlaki, is the only one on the entire island and has a large collection of sailboats and windsurf kit. The bay is very spectacular and offers views of a sea that has the same colour and clarity as any island in the Caribbean. This is due to the fact that most of the beaches in Corfu are not sandy and are instead pebbley. We were in Corfu for 2 weeks (from Monday to Monday) with one week in two different villas on the north east tip of the island.I decided to try out the sailing on the last Saturday of our first villa. I naturally wanted to sail and my brother Ollie wanted to go in a Topper. The wind looked okay (Force 3) and I chose a Laser One (which I would go on to sail for the rest of the holiday). We met Malcolm a cheerful scottish 20-something year old who had dropped out of University and had just come one day to go sailing in Corfu and loved it so much he got a job for the rest of the summer. 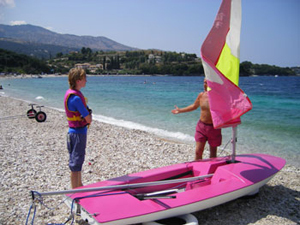 He helped Ollie and I put my boats together whilst discussing boating experience and sailing. 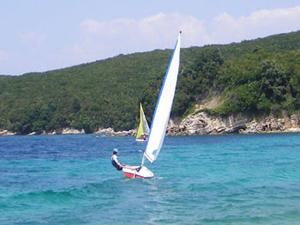 He is a keen windsurfer and sailor and instructs both at the centre. Finally we were both ready to go. Jan gave us a little prep talk about what we could and couldn't do such as not going out of site of the sailing centre, but we were allowed to go as far out as we wanted. For the first 15 minutes of sailing in Corfu, I was enjoying myself, sailing everywhere around and familiarising myself with area (we hadn't acutally booked this particular session, but I wanted to try it out). However after that the wind completely died to give way to a disappointing Force 1. Jan assured me that this was not normal for the area and I said that these things happen. We came back on Tuesday (second day of our second villa) and did the wind pick up! It started off with an encouraging Force 4, which climbed to a Force 5 at around 3pm. Once I was outside the bay itself my boat was hit by Force 6 winds. I decided that the most fun thing to do would be to beat up to the edge of the bay and then go on a Beam Reach so that I could plane around. The wind was so strong that I hiked out at the very back of the boat with my knees completely out, with only my toes keeping me in. This was the adrenaline rushing experience that I wanted! Even after I came back in my heart was pumping like mad and I was the only one left on the water speeding around and getting a lot of attention from powerboaters and sunbathers on the beach. I went on to sail on Wednesday, Friday, Saturday and Sunday in winds around the same as on the Tuesday. It was a brilliant experience and made all the more fun watching completely clueless people trying to right a capsized boat and being unable to tack. So many good times that I will remember as well as meeting the regular sailors who come to Jan year after year. I hope I can go again!